SYNOPSIS: Fun PG-rated film that was a cable television staple in the 80's. Just a few years before battling The Terminator Linda Hamilton had to go up against a psychotic gun-toting loner. 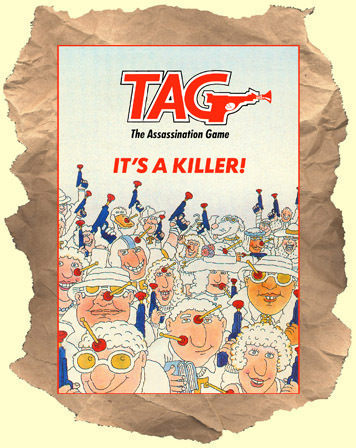 The premise is a game played by college students call "T.A.G." (or The Assassination Game). Players get orders to assassinate targets and they stalk & shoot them with suction cup-style toy guns. Eventually a winner will be announced. Bruce Abbott (acting more like his Re-Animator co-star Jeffrey Combs!) is an unhinged TAG player, and reigning champ, who finally snaps and starts playing with a real gun! As the bodies start piling up in his dorm room it becomes obvious that his final target to win the game will be Linda Hamilton. Robert Carradine provides some comic relief as a cigar-smoking gumshoe reporter who falls for Hamilton and uncovers the murders. It combines thriller, action, comedy and film noir elements into a recommended winner. An entertaining sleeper that would make a great double-bill with Gotcha!